Sweep was the word of the day at the Husker Invite on Friday with Missouri State winning twice in straight sets and Nebraska posting victories in three and four sets. Key Stats: Missouri State put up 11 blocks and outhit New Mexico .190 to .107 in the match. The Bears started with a .289 hitting effort and fell to .208 and then .079 in the final stanza. The Lobos hit .213 in the opener but failed to reach .100 after that (.026 and .054). New Mexico managed two more kills (38-36), but trailed in aces (5-4) and blocks (11-6) and gave up 25 points on hitting miscues. Stat Leaders: A balanced offensive attack saw four Bears players turn in seven kills or more. Laynie Dake, Aubrey Cheffey and Amelia Flynn notched eight apiece, while Cambree Villarreal added seven putaways on a team-best .318 hitting effort (7-0-22). Flynn rounded out a double-double with 15 digs and three blocks, while Dake put up a team-high six stuffs and added two aces. Makina Wratten and Chloe Rear also aided the team on the blocks with five and four respectively. Tai Bierria registered 10 kills for the Lobos, while Carly Beddingfield added nine. Mariessa Carrasco was tops in blocking with three stuffs, while Lauren Twitty posted 11 digs, seven kills and two aces. It Was Over When: The teams combined for 19 hitting errors in Set 3. Missouri State took the early 5-2 edge and upped the margin to five at 11-6 with kills by Cheffey, Rear and Flynn. The Lobos erased the deficit with a 6-1 run to tie it up at 12 on a Bierria putaway. The teams traded four-point rallies to bring it to a 16-all tie. Down 18-16, New Mexico rallied with five of the next six points to take a 21-19 lead with help from two Bear miscues. Missouri State sealed the win with a 6-2 run, capping the win on an ace by Flynn. Key Stats: Eight aces, nine blocks and a .347 hitting effort lifted Nebraska to the quick hour and 12 minute victory. The Huskers hit at a .750 clip (12-0-16) in Set 3 to salvage their hitting numbers, while holding CMU to a .087 effort. Nebraska led the way in kills (34-27), hitting percentage (..347 to .150), blocks (9-2) and aces (8-0). Stat Leaders: Mikaela Foecke and Lauren Stivrins posted nine kills apiece to lead the Huskers, while Jazz Sweet added seven putaways on a .600 hitting effort (7-1-10). Callie Schwarzenbach was tops on the block with five stuffs. Lyza Myers and Savannah Thompson registered eight kills apiece, while hitting .350 or better to lead the Chippewas. Myers hit .429, while Thompson hit .350. Jayla Wesley managed two blocks for CMU. It Was Over When: After five ties in Set 3, Nebraska pulled away with an 11-2 run, including two Nicklin Hames aces and a kill and three blocks by Schwarzenbach to go up 16-7. CMU scored three of the next five, but it was all Huskers from there, including three blocks in the final 7-1 rally. Key Stats: Central Michigan could not get out of its own way in the match, committing 26 hitting errors and hitting -.030 on the night. 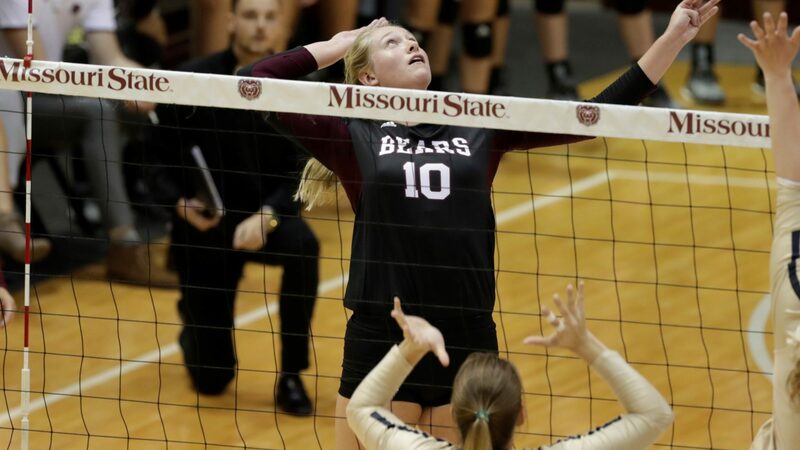 Missouri State had a down outing in Set 2 (.083), but bookended the night with .308 and .256 efforts. The Bears nearly doubled the Chippewas’ offensive output with 42 kills to 23. CMU served up three aces, while also boasting an 8-7 lead in blocks. Stat Leaders: Aubrey Cheffey and Amelia Flynn were the offensive standouts for the Bears with 11 kills apiece, while Ashley Ophoven added seven. Cheffey hit at a team-best .400 clip, while also putting up four blocks. Laynie Dake chipped in four putaways and six blocks. Chloe Rear just missed a double-double with 34 assists and nine digs. Five CMU players registered three or more kills, led by Kalina Smith and Lyza Myers with five apiece, although both players hit in the negative for the match. Myers added three blocks as did Jayla Wesley. Wesley also chipped in four kills alongside Savannah Thompson. It Was Over When: After taking an early 3-1 lead, Central Michigan was outscored 10-5. Four Chippewas miscues helped Missouri State to the 11-8 advantage. CMU tied it up at 13, but the Bears took over from there with a 6-0 run, including three more errors and two Cheffey putaways. CMU was within four on four occasions, but could not break through. An Ophoven kill made it 24-19. Thompson stopped the first match-point try and a hitting error kept things going, before Cheffey wrapped up the win. The wait was finally over for Husker fans hoping to see All-Big 12 transfer Lexi Sun in a Nebraska uniform. Sun was in the starting lineup in the match and registered her first kill at 4-all in Set 1 and went on to total a match-high 13 kills on a .346 hitting effort to go with five digs, two blocks and an ace. Mikaela Foecke joined Sun with 13 kills, while hitting .393 and adding five blocks, five digs and two aces. Lauren Stivrins tacked on seven kills and three blocks. Callie Schwarzenbach led the way at the net with 13 blocks, tied for third-most all time in the rally scoring era and the most since Cecilia Hall put up 13 stuffs vs. Michigan on Nov. 22, 2014. It is almost the most in a a four-set Division I match in 2018. Tai Bierria paced New Mexico with 16 kills. Lauren Twitty added nine putaways, 10 digs and a team-best two blocks, but hit -.029 for the match (9-10-34). Nebraska outhit New Mexico .282 to .040 and outdid the Lobos in kills (42-39), blocks (16.5 to 3) and aces (6-2). New Mexico struck first, however, boasting a 14-10 lead in Set 1 and using a late surge to pull off a Set 1 upset. The Huskers scored nine of the next 11 points to vault ahead 19-16. Nebraska was in control at 22-20, when the Lobos turned its around with a final 5-1 run, including two blocks and two kills by Twitty to seal the 25-23 win. After falling behind 4-3 in Set 2, Nebraska quickly built a 10-point advantage at 17-7 with help from six Lobo miscues and four Schwarzenbach stuffs. The Huskers led by as many as 13 (22-9) after another Schwarzenbach block before closing out the win on a stuff by Stivrins and Sun. New Mexico grabbed an 8-6 edge in Set 3, before Nebraska turned the tables with seven of the next 10 points. Foecke notched three kills in the stretch as the Huskers went up 13-10. The teams stayed close with the Lobos cutting the margin to one at 20-19, before a 5-1 run, capped by a Sun putaway put Nebraska up 2-1. The Huskers wasted no time making a statement in Set 4, going up 8-2 with four New Mexico errors and an ace by Hayley Densberger. The Lobos would get no closer than five the rest of the way (8-3). Up eight at 16-8, Nebraska closed out the night with nine of the final 12 points, including four kills by Sun. A service error gave the Huskers the 25-11 win on their second match-point try. The victory marked No. 700 for head coach John Cook, making him the 10th active Division I coach to reach the milestone and 27th all-time.